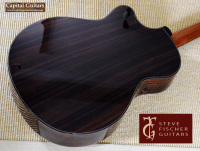 Steve Fischer has built guitars sold under both the McPherson and PRS brands. 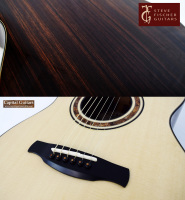 He was integral in helping Paul Reed Smith introduce his initial line of high performance acoustic guitars. Had he and his family been able to adapt to life on the east coast, Steve would likely still be working for PRS. Instead, they returned home to Utah where he has set up his own shop. 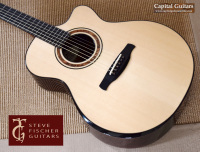 His love for classical style instruments, his 'x-fan' top bracing and other innovative build techniques are quickly helping him establish his own brand of high-end acoustics like the Concerto model offered here. 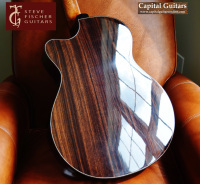 The Steve Fischer Concerto is a medium sized, 14-fret instrument sized somewhere between a Grand Concert and a Grand Auditorium guitar. It has a body that is 21-1/4" long, 3-3/4" to 4-1/4" deep, an upper bout that is 11-1/2" wide and a lower bout that is 15-5/8" wide. 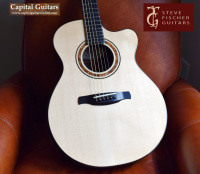 This particular instrument was ordered with an optional Venetian cutaway and arm contour, an upgraded German Spruce top and back and sides of very straight-grained East Indian Rosewood. It has a 25-11/32" string scale, with a custom 1-13/16" (1.81") nut width and and 2-3/8" string spacing. It has a Mahogany neck with a comfortable low profile C-shape. The binding, fretboard, bridge, arm contour and tuner buttons are black Ebony. The tuners are Schertler open backs. It is an exceptionally elegant instrument. This is a very lightly braced instrument and it is powerful, yet balanced across the frequency spectrum and quite clear-voiced. 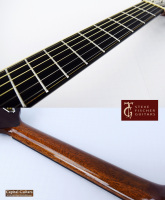 It is very responsive to your level of attack, so it is easily shifted from subtle and nuanced to loud and thundering and is equally suited for strumming or finger picking. Please check out the brief sound sample provided below. As is common for Steve's guitars, the factory setup is a bit higher than typical at 7/64" and 6/64" on the low and high E sides, respectively, but there is lots of room for saddle adjustment if necessary. Despite this and the relatively wide custom nut width, I found the guitar a dream to play and I typically choose a 1.75" nut. This guitar is in excellent plus condition with virtually no flaws save for a single pen tip sized impression on the top on the lower bout. I've done my best to picture it in the included photos, but I doubt you will be able to see it except under intense lighting and very close up. This tiny issue aside, this guitar is in near mint condition and the frets show no observable wear. It comes in it's original Ameritage case, also in superb condition. 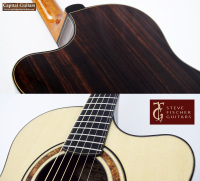 To order this guitar new from Steve with these options would cost $8K. Get this gorgeous and lightly played example for less than half that sum. 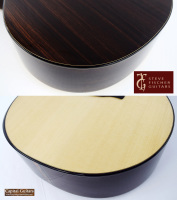 One elegant high end acoustic indeed and at a great price point!